Thanks so much for stopping by for the eighth day of my BIG giveaway! I am BEYOND BLESSED to work with some amazing companies who have offered up some of their awesome products. Not all of the giveaways are necessarily sponsored by the companies (meaning, some of the stuff I had at the house and wanted to spread the wealth), but even still, they are all companies I love and want to spread the word about. Just a word of warning: Make sure to stop back daily as I will be having a new giveaway every day for the next FOUR days and would hate for you to miss out on any of them. Also, some of the entries are available daily (ie tweeting about the specific giveaway, pinning a picture on Pinterest, etc), so if it is an item you are super stoked on, I’d recommend entering as many times as possible. When I first started running I didn’t know much (and, to be honest, I am still pretty clueless when it comes to most aspects), so all I did was run. With the repetitive movement of pounding the pavement (with no cross-training, strength-training, stretching, etc), my IT Band quickly got angry at me. After some Googling, I decided I needed a foam roller. I didn’t know much about them (and with me being “frugal”), so I just ordered a tube of foam off Amazon. It worked well enough, but after a few weeks the foam started to depress in the middle and I knew I needed something a little more sufficient if I was going to continue running. Around that time I remembered seeing that RunEMZ mentioned an M80 Roller and I figured if it was good enough for her and her crazy running endeavors, then it was more than enough for me! I ordered mine and haven’t looked back! 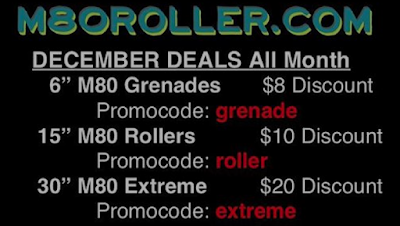 The M80 Rollers are sturdy. Picture a piece of PVC pipe with some foam on the outside of it. It doesn’t have much give, but that is exactly what my legs need. I absolutely love my roller (even though, at times, it is more like a love/hate relationship). I makes my legs scream "THANK YOU" (but sometimes I really want to scream obscenities because it hurts so good ;) ). 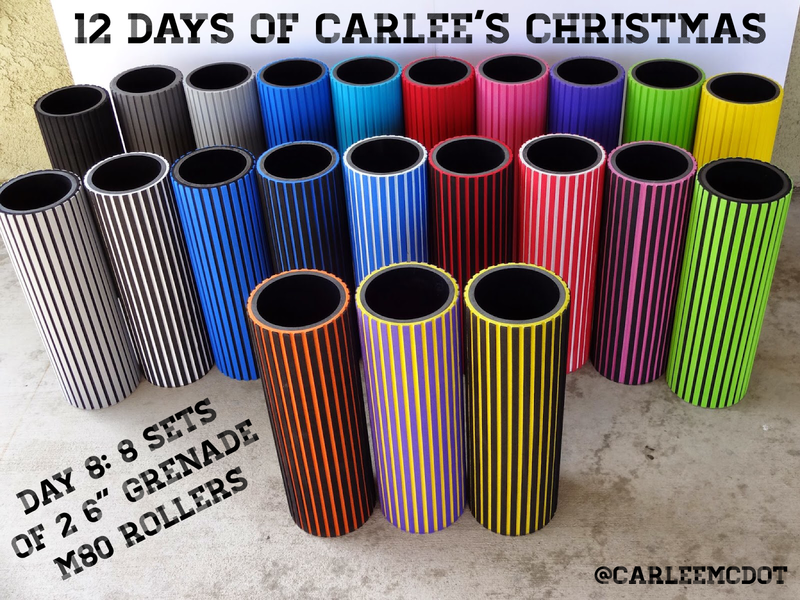 Matt, the owner of M80 Rollers, is AMAZING and has offered up two of the 6” Grenade rollers for EIGHT winners! 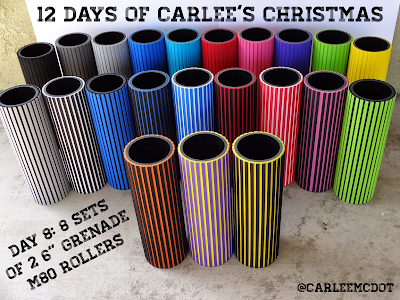 Yup, eight people will be walking away with two of the these amazing rollers! The 6” size is great for travel. You could keep one at home and one at the gym (or you could gift one to your BRF). 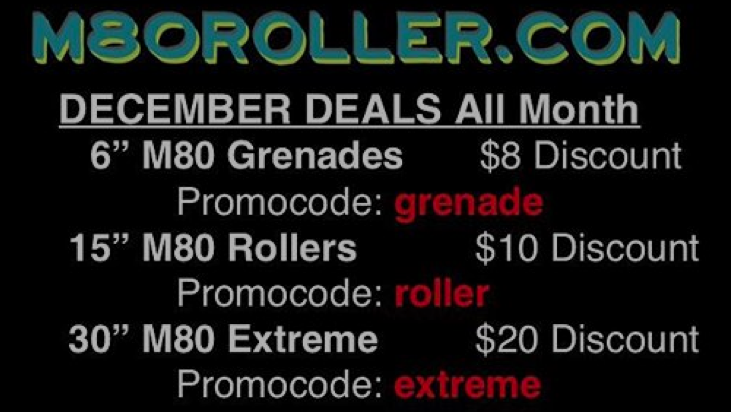 A HUGE thanks to M80 Rollers for sponsoring this giveaway and supplying the prizes! I swear, your legs will thank you for introducing them to these rollers! And just in case you aren't one of the lucky eight, Matt has an AWESOME deal going on that you do NOT want to miss out on! As with all of these giveaways, they will run for seven days. The winners will be selected on the eighth day. This one will run through December 14th at 11:59pm. The giveaway is open to US residents only. The winners will be contacted via the email address associated with their Rafflecopter account and will have 24 hours to claim their prize. All entries are verified, so please be sure to complete them or a new, random winner will be selected. heck yeah I do!!! And mine is just about dead, so this would be PERFECT! 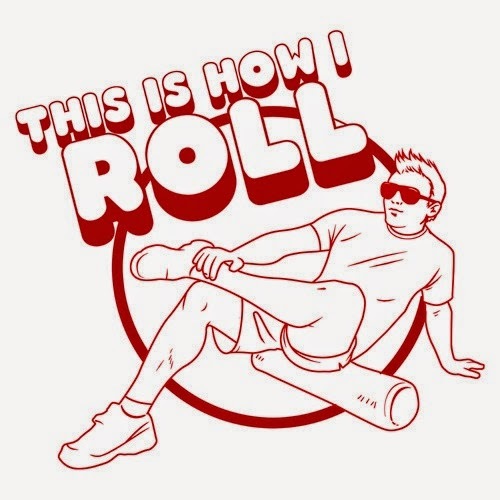 I currently use an Addaday roller (non foam) but I could use a good foam roller! My current one is too big and bulky! I actually don't foam roll yet! I used to in physical therapy, but I don't have a foam roller set of my own yet. Oh, do I ever!!! It's becoming a nice habit for me! This is a habit I need to get into! Love the colors on these! I want a purple one! I do but not as often as I should. Need to be more vigilant about doing it! What an AWESOME giveaway! I do foam roll but not as much as I should.. shhh! 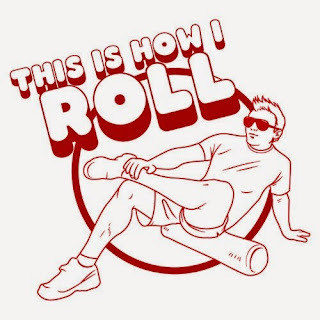 Oh yeah i foam roll.. From back to legs I love it! I use "the stick" right now, but I foam roll at the gym and would LOVE to have one at home! Im so horrible abput rolling and i know better...id live to have one of these then NO EZCUSES RIGHT? I need to be a lot better about rolling--having some aches and pains and just need to make the time! I have a stick instead of a foam roller. I wish I would have gotten the roller originally! I do not because I do not have foam rollers. But my IT band would love this for Christmas. foam rolling has helped my running tremendously! I need to looking these rollers. I do roll. I am frugal and got a plain foam one from a big box store. but this one looks awesome! My IT band needs this......it stays angry a lot. Not like I should. I am bad. This would be good for my fascia. No I don't foam roll just because I have been too cheap to buy one, but I know I should! Yes. My IT bands demand it! My legs would be forever grateful! Thank you! I don't foam roll nearly as often as I should. I don't foam roll because I don't have a foam roller! I could definitely use a smaller foam roller for travel. Never have foam rolled before...maybe I should give it a try! My favorite roller by far! I have a cheap foam roller too and am SO ready for an upgrade!! When I remember! I really did wish I foam rolled more often though. I roll occasionally but it's a habit I'm trying to get into more. My foam roller is massive, like 4 feet long, so a small one would be so much easier to maneuver! I don't because I don't have a foam roller! Would be good for me I'm sure! This is great! I would love to try this brand. If it's good enough for Emily AND You, it must be awesome!! I don't foam roll, I need to build my core muscles before I try to roll my leg muscles. Safety first. I can see how this is something I should start doing. I love my foam roller but want to try a M80. I've never used one of these before. I can see how it would be good to use though. I'd love to have one! foam rolling, oh how I love to hate it! Here's the funny part: the very first time I tried foam rolling, I was working with a personal trainer in Portland. She had me do every crazy painful position, and I felt...nothing. Well basically nothing. It was like a light massage, even with my full body weight on it! I'm not sure if it was because I was still 20-something, or was doing yoga daily, or what, but I was like, "um, the point of this is what?" Foam rolling is the only way I'm able to keep running! I've battled knee injuries and then recently horrific shin splints and without my roller I'd spend way more time on my couch. I have just recently really got into foam rolling after having knee pain from tight muscles, it's quite helpful! i try to foam roll every night. My PT said I should be doing it at least twice a day so working on getting to that point. I have a roller stick I use sometimes but it's a little difficult to get some areas with the stick form... I would love to have one of these! I don't as much as I probably should and my my IT band isn't so happy with all the miles I've recently run so I probably should get into this habit. I love my foam roller -this is a new to me brand I would like to try. I do but I need to be way more consistent!! my bf wants me to have one but he has already gotten me so much...so this would rock! I need to be better about foam rolling :( I have made it about 20 seconds before it hurts. New Years Resolution is to do that more! I don't roll daily, but I know I probably should! I have asked for one for Christmas!! I've never foam rolled, but the more I've been running the more I think I should start doing it! Oh yeah- saves me during marathon training! I foam roll EVERY SINGLE NIGHT! I have to! I don't foam roll nearly as much as I should, but it has really helped with any injuries and "niggles" I've had. This roller is awesome! I'd like to say yes often but the honest answer is very sporadically. I must do better! Thanks for the chance to try a new roller!! Not really. My hips could use the IT band rolling love. These look awesome! yes, but I not nearly often enough! I love to foam roll but would love to have my own and not have to always steal my son's!! I've had IT band issues since my first race that happened to be in the pouring down rain-and since then my foam roller is my best friend! Thanks for such a great giveaway! I foam roll about half as much as I should. I am trying to get my fiancee into the rolling game! Having another roller for him to use at the same time as me would definitely help my cause! I do love my foam roller! I like the name of these...sounds like they're going to blow up my tight muscles! Would love one. I borrow my son's. My dog ate my lastfoam roller. I sure do! I also love my stick as well for getting the ouchies out. I do but my roller is not as snazzy! yes! but not as often as I should! What a sweet giveaway Carlee! awesome blossom! I currently do not but I really want to win one and start. I don't have one but I do use a foam roller when I have access to one to help stretch my muscles. Yes! Even my teenage daughters know the love/hate of a foam roller. Sometimes.My husband swears by it though and I know he's love a nice roller like this. i think i can count on my fingers the number of times i've actually foam rolled...oops. i need to be a LOT more consistent about that. I will if I win! I don't foam roll. but I KNOW that I should. I would love to win this! Yep, I love to foam roll. I use The Stick and Yoga Tune Up balls. I haven't gotten into foam rolling yet, but as my training progresses for a full marathon in the spring I think I'm going to need to start! i do foam roll and love/hate every minute! Not only do I roll, but I make sure ALL my patients roll! This roller looks intriguing!! I roll occasionally, when I can at the gym. I know I need to more though. I can tell the difference when I do roll. I've been wanting to get a foam roller so I can do it more often at home! Have never tried one but have been wanting one! I could actually do a better job at foam rolling, so this would be perfect to win! Foam rolling is my favorite exercise!!! I could foam roll for hours! My dancers have a love-hate relationship with the foam roller! No but I want to try. I do roll, but I wasn't so sure in investing in one at first. I'm afraid the one I bought is no longer firm. Um.....I try to! Sometimes it is so painful! Heck Yes I do!!! Makes me feel fabulous afterwards, though its positively torture doing it! I don't foam roll nearly as often as I should be, although I am getting better at it! No but I will if I win and so will my husband! I try to! I'm in the market for a new foam roller so I've been using random objects. I foam roll 2-3 times a week! I use an old Gold's Gym roller though, that could really use an upgrade! YES! I need to get a little more regular, but it has been so helpful when I do. I've never tried a foam roller...yet! I just started rolling this year! Can't believe I waited so long! It has made a huge difference in my recovery! My brother is in the process of trying out for professional soccer teams and could really use one of these!! I've never foam rolled, but I've been getting some hip pain and have been considering this! I foam roll after long runs. I foam roll, but so rarely I should probably say that I don't. :( My roller is just so awkward to use. I do foam roll, but certainly not as often as I should. I do foam roll - but I'm not as good about it as I should be!! I do roll, but I should do it more often!